This weekend, former two-division Shooto world champion and current flyweight King of Pancrase Mamoru Yamaguchi returns to action at Pancrase 289. The 40-year-old fighter will defend his title against Senzo Ikeda, and the card will air live on UFC Fight Pass. Yamaguchi, currently ranked #26 in the flyweight division, might not be the most recognizable name to average MMA fans. However, you can’t tell the story of the MMA’s flyweight division without including him. In 2000, he became the first Shooto featherweight (132 pounds) champion with a victory over Jin Akimoto. Three years later, he took the first Shooto bantamweight (123 pounds) championship after defeating Yasuhiro Urushitani. Urushitani went on to participate in the tournament to determine the first UFC flyweight champion. 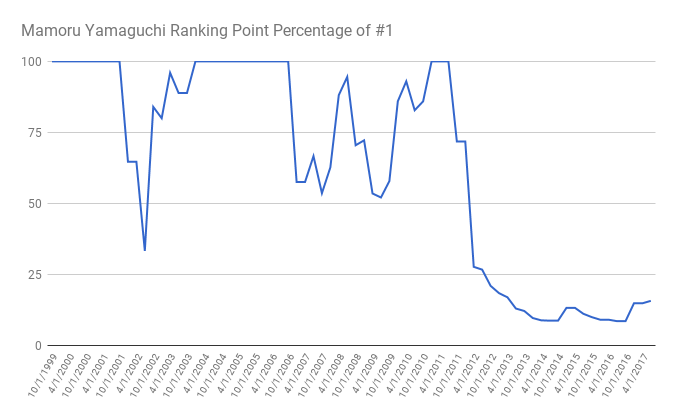 The following chart shows the percentage of Yamaguchi’s ranking points compared to the number-one ranked fighter in his division for each quarter of his career. The higher the percentage, the closer to the number one ranking for Yamaguchi. This is a similar calculation used to determine the “Fight Matrix Most Lopsided Upset of the Year” award. As you can see, Yamaguchi was not only a pioneer of the flyweight division but also a perennial contender until the UFC adopted the division in 2012. At his advanced age, it is impressive that he is still ranked near the flyweight top 25. His current run as King of Pancrase is a dignified culmination of a historic career, which, unfortunately, is rarely seen in the sport.